The round table debate, which was open to the public, was held on 28 September 2016 in Montpellier, France. 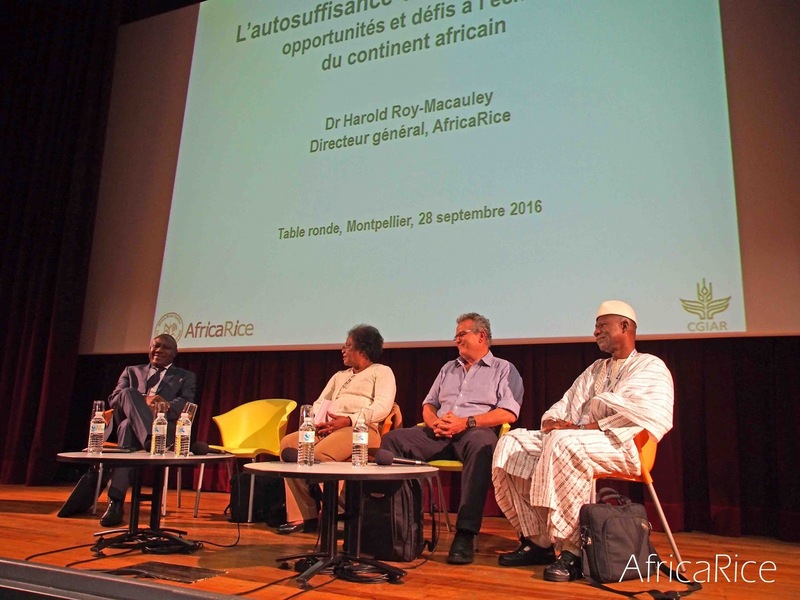 The other panelists were Jacqueline Rakotoarsoa, FOFIFA Research Director, Madagascar; Gaoussou Traoré, Coordinator of the National Rice Center, IER, Mali; and Fréderic Lançon, CIRAD Economist, France. The discussion was moderated by Safi Douhi, journalist from Biofutur, a leading French magazine on biotechnology. “Achieving rice self-sufficiency in Africa is a complex equation,” explained Dr Roy-Macauley, underlining that the demand for rice, which is growing at more than 6% per year, is linked to high urban population growth rate. He added that factors such as strong lobbying of rice importers in Africa and low investments in the rice sector should be also taken into account. He highlighted that the rice sector in Africa faces major challenges such as lack of favorable rice policies in SSA, weak links among value chain actors, low mechanization and climate change. At the same time there are big opportunities such as the high potential of rice in the continent for food security and employment generation, untapped natural resources in the form of land and water, the rich reservoir of genetic resources in the African rice germplasm pool and the availability of genomic and bioinformatic tools, which will help scientists address the need of sustainably increasing rice yields in the continent. Explaining that AfricaRice’s strategic vision is to help Africa achieve almost 90% self-sufficiency in rice by year 2020, Dr Roy-Macauley gave examples of research outputs by AfricaRice and its partners, ranging from improved varieties, agronomic practices, approaches, tools to policy findings as well as training efforts, which are contributing to rice self-sufficiency in SSA. In conclusion, Dr Roy-Macauley said that the combination of four factors is essential for boosting the rice sector in Africa or “Africa Riceing” as AfricaRice calls it: (i) strategic crop (ii) good science and innovation (iii) value chain approach and (iv) favorable policies. He emphasized that important new initiatives such as the CGIAR Research Program called “RICE” and the African Development Bank (AfDB)-funded “Technologies for African Agricultural Transformation (TAAT)” project, among others, with innovation platform approach and public-private partnerships will help to do this. 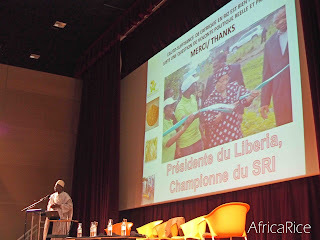 Following his presentation, Jacqueline Rakotoarsoa, FOFIFA Research Director, Madagascar and Gaoussou Traoré, Coordinator of the National Rice Center, IER, Mali, made presentations on the rice situation in their respective countries. Both Madagascar and Mali are close to achieving rice self-sufficiency, although they still have some challenges to overcome. 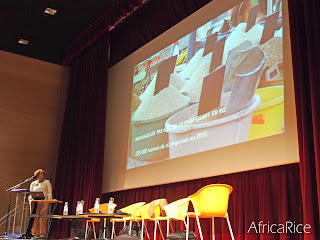 Frédéric Lançon, CIRAD Economist, France, raised critical policy issues relating to rice self-sufficiency in Africa. 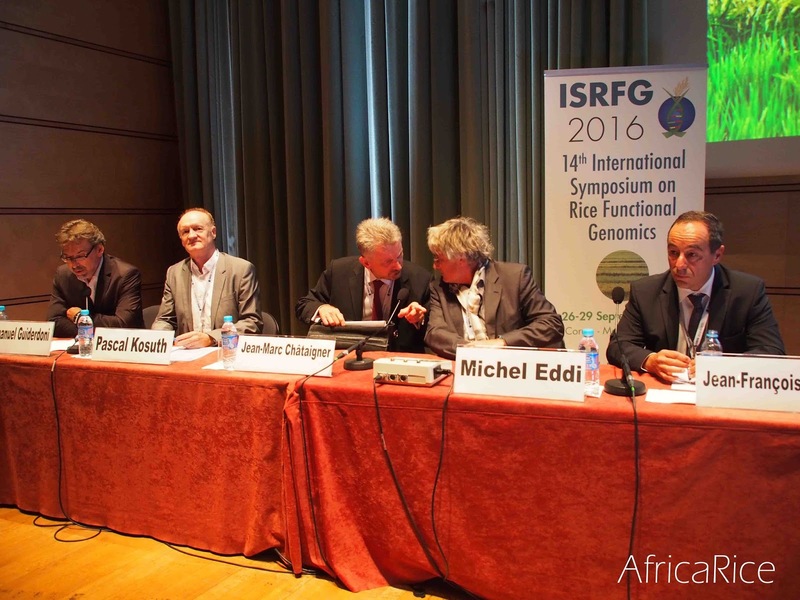 The round table was organized as a side event of the 14th International Symposium on Rice Functional Genomics (ISRFG 2016), hosted by French research organizations in Montpellier, France, 26-29 September 2016, which was attended by more than 300 participants from around the world, including a delegation from AfricaRice. The AfricaRice delegation was led by the Director General accompanied by Deputy Director General-Director of Research for Development, Etienne Duveiller, key scientists of the Center’s Genetic Diversity and Improvement Program and communication team. Welcoming the AfricaRice Director General and Deputy Director General to the opening ceremony, Michel Eddi, CIRAD President Managing Director referred to the rice component of the AfDB-funded “Technologies for African Agricultural Transformation (TAAT)” as an important initiative being implemented by AfricaRice to promote the use of products emanating from upstream research in order to respond to the challenges of rice self-sufficiency in Africa. The Mayor of Saint-Georges-d'Orques and vice president of Montpellier Agglomération Jean-François Audrin, IRD Deputy Executive Director Jean-Marc Châtaigner and Director of Agropolis Foundation Pascal Kosuth were the other speakers at the opening ceremony. AfricaRice scientists were actively involved in the ISRFG 2016 symposium, which gave a high importance to young scientists. The opening lecture of this symposium was delivered by AfricaRice Molecular Biologist Khady Nani Dramé, on "Molecular breeding to boost rice production in Africa". Baboucarr Manneh, AfricaRice Irrigated Rice Breeder and coordinator for the African component of the Stress-Tolerant Rice for Africa and South Asia (STRASA) and the Green Super Rice (GSR) projects, made a presentation on "Genome-wide association studies to identify QTLs for yield and yield-related traits of rice in the Sahel zone of Africa" under the theme “Rice diversity harnessing for gene discovery and precision breeding”. An AfricaRice exhibition booth with subject-specific posters and video at ISRFG 2016 attracted many visitors interested to know about the Center’s work and achievements relating to genetic diversity and improvement. Publications on AfricaRice, the Global Rice Science Partnership (GRiSP) and STRASA and GSR projects were distributed. A workshop on African rice was also held at ISRFG to gather researchers, who are interested in the potential of African rice, and to exchange ideas for joint research. 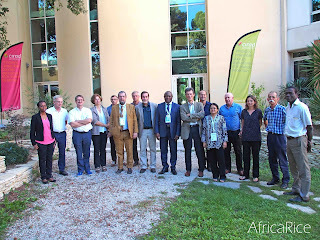 AfricaRice and the French agricultural research institutes – CIRAD and IRD – have a long history of partnership on rice research for development. They are among the key architects of GRiSP along with IRRI, CIAT and JIRCAS. Prior to the round table, Dr Roy-Macauley, Dr Duveiller and key AfricaRice scientists had a technical partnership meeting with research leaders and scientists from IRD and CIRAD, led by Jean-Luc Khalfaoui, CIRAD Director General in charge of Research and Strategy. 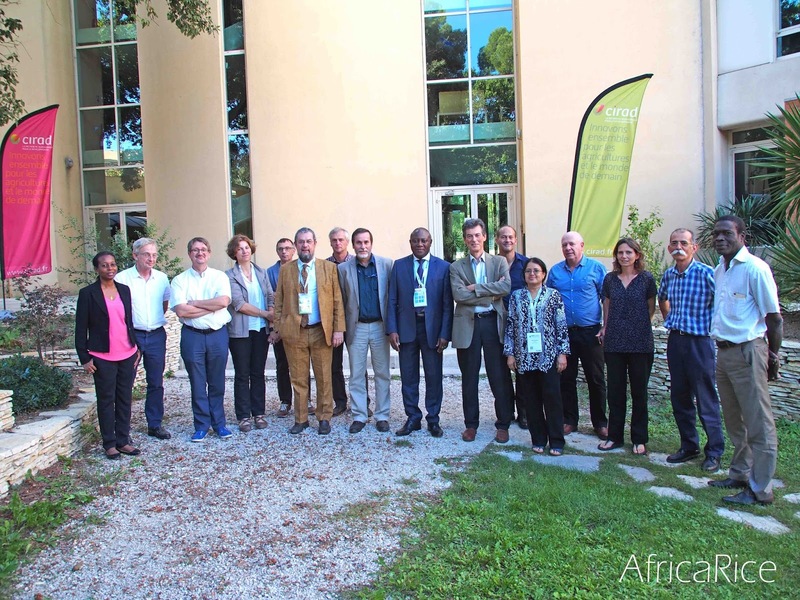 The partnership meeting, which was moderated by CIRAD focal point for rice-related research Nourollah Ahmadi, began with presentations on all the recent and ongoing CIRAD and IRD joint projects with AfricaRice. This was followed by discussions focusing on further strengthening the fruitful research collaboration with the development of joint proposals on major emerging challenges relating to the rice sector in Africa. Scenes from the 14th International Symposium on Rice Functional Genomics (ISRFG), Montpellier, France, 26 Sep 2016.